The Vo-Cal Chair™ is a combination of several dynamic sciences and has resulted in one of the most highly-acclaimed products of recent decades. The Vo-Cal Chair™ first detects subconscious stress indicated through the voice and displays it as a voice map through the Vo-Cal 360™ software. The range and specific frequencies of the voice map relate to specific types of subconscious stress. Sophisticated software then analyzes the voice map and outputs the ideal frequencies through sound vibrations to balance out the voice map. The Vo-Cal Chair™ has consistently obtained highly-repeatable, permanent, observable and measurable results. One of several breakthroughs discovered during the Vo-Cal Chair’s™ five-year developmental phase is that much of the stress individuals encounter is genetically inherited. If these ancestral ties, miasms or genetic encodings are not dealt with directly, they continue to exert an energetic force which makes permanent improvement an ongoing battle and sometimes impossible. In The Vo-Cal Chair™, the client sits in a specially designed solid teak wood chair with two sound transducers on the back and base of the chair. The client also wears special light glasses with white lights that flash in varying frequency and patterns. Any shapes or colors seen during the session are strictly the client’s energetic patterns, and everyone is unique. The client wears headphones with a special powerful magnet in the top center to be placed at the top of the head with special music to invoke the emotions. A voice map is then obtained from the client and the inverse frequencies obtained from the voice map software are then fed into the chair to cause the chair to resonate and thus assist in liberating any limiting ancestral imprints from the client’s subconscious. Thus freeing the client of their energetic stresses. The reason for this amazing emotional and physical healing that takes place with the Vo-Cal Chair™ is still theory at this point but it is believed that this technology somehow goes into the body at the cellular level and corrects the energetic imbalances that cause organs to shut down, disease to manifest, pain, various imbalances not too mention the overall lack of energy most all of us suffer from. The level at which this technology heals the individual riches beyond fathomable limits. One day we hope to have universities with volumes of books written on this amazing healing Phenomena. The vast majority of clients who experience the Vo-Cal Chair™ report decreased stress, and enhanced joy and peace. And because persistent subconscious stress is closely related to specific health challenges, some clients also report dramatic improvements in specific health challenges, many of which have been documented by medical doctors. Such results have become the expectation rather than the exception of practitioners who implement the Vo-Cal Chair™ in their practices. The voice contains coded information about your state of mind and body. Just speak to someone on the phone for a moment and you can hear if they are happy or sad or sick. When you have an emotional reaction, the brain releases a chemical. Within this chemical is stored the thought process and the MEMORY of that experience. Emotions are designed to chemically reinforce an experience or information into long term memory. This bio-chemical memory is then discharged by a synapse, which allows the emotion to come and go. Sometimes, the synapse does not “fire” and the bio-chemical becomes locked between the synapse and the cell. This “chemical memory”, imprinted with the thought process, continues to run like a CD on continuous play. It can be stored in the cells and passed down generation to generation through the DNA structure. Thus, one can inherit thought processes and patterns, such as anger, abandonment, distrust, lack of self worth, emotional disconnect, survival issues, etc. on a sub or unconscious level. These thoughts and patterns can then unconsciously direct our lives, interfering with our ability to live our lives in the way we choose. The hypothalamus produces a chemical to match every emotion that we experience. The brain does not differentiate between what it sees in the present moment and what it remembers from the past. The stored chemical memory, whether inherited through DNA, acquired through life experiences, or in present experience, use the same neuro-nets and synapses when firing. Thus a present experience can be influenced by a past or inherited emotional response or belief. The Vo-Cal Chair™, through state-of-the-art technology enables the brain to gently, yet effectively release the chemical produced by the hypothalamus. This in turn, will flush the bio-chemical memory from the cellular structure, rendering inner peace, ease in life and joy. The Vo-Cal™ software allows you to see through voice pattern imaging why you energetically bring to you certain people, situations, actions and reactions in your life. By eliminating the chemical memory, you diffuse the energetic charge behind emotional wounds and disharmony. A simple yet effective release of an energetic imbalance. The Vo-Cal Chair™ process consists of a voice pattern mapping with the Vo-Cal™ software. 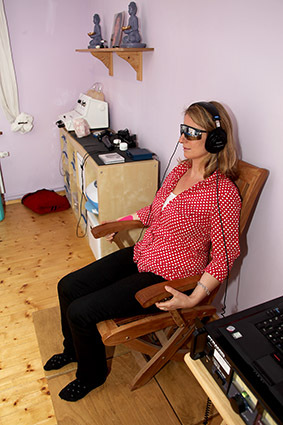 Computer generated playback of missing frequencies from your voice pattern along with specific gentle music through the headsets, and “light frames” (glasses with small flashing white lights) are played back to the client through the chair. Once the voice pattern is recorded, the Vo-Cal™ software determines the Optimum Deficiency. This is the area of the voice where the greatest compensation is occurring. The Optimum Deficiency or OD is used as an instruction to the Vo-Cal Chair™ which generates a sequence of very low frequencies which is your voice pattern resonance played back to you without the words you spoke. The custom built wooden chair has special transducers attached at specific points to allow the frequencies to resonate through the wood to your body and every cell. The light frame glasses help access the subconscious mind. Even though your eyes are closed and the lights are flashing white only, you see a kaleidoscope of colors, geometric shapes and patterns. This is all encoded information and memory that has been filed in your brain being released. The experience is nothing short of amazing. Something you just have to see, feel, experience and witness for yourself. This technology will truly revolutionize the healing process not too mention speed the shift of consciousness. It can take 10-15 sessions to clear your lineage. The immediate lineage consists of mother, father, maternal and paternal grandparents, spouses and ex-lovers, immediate family and you. This may also include anyone or event that still surfaces as an emotionally charged issue. If your attention is on it, there is an emotional/energetic issue that can and will manifest its ugly head. The first session can run about 2-2½ hours. It takes longer than the subsequent sessions because you voice map every person and issue you are working on goes first. The rest of the sessions start by using the original voice map and last from 1½ to 2 hours. You can process one person or issue per session only. Occasionally on particularly deep and difficult patterns you may need to do more than one session on a person to clear it out. If that does occur it is important to come back and clear it within 24-48 hours. This indicates that the body needs some processing time before it can completely clear the energy. There is no way to predict if you will need more than one session on a person as everyone is different. Once you clear your lineage, you can process specific issues, such as health, procrastination, self sabotage, etc. Often you will find that these issues automatically dissipate as you clear your lineage through the initial mapping process. Once all this negative energy gets cleared you can now work on positive energetic things such as your goals, dreams, aspirations, visions of peace, whatever you want. You can literally get rid of karmic imbalances and change your stars. Another major plus with the Accelerator Chair™ is that when parents of children, usually younger than 10 years old, do their work in the chair their children get clear automatically without ever having to go in the chair. We can now free our children of our karmic and energetic bonds allowing our children to fully shine in all their glory. These are very exciting times! This IS an amazing technology far ahead of its time! How do we inherit our ancestors’ health patterns, subconscious stress and perceptions? Peptides also create the sensations that we experience as emotion. Such sensation may both cause and be caused by specific thoughts or perception. Traumatic experiences in particular frequently results in strong emotional reactions that are stored within the brain’s neural pathways and the cells of the body – locking an individual, to some extent, within the same emotional experience. Whether or not the Vo-Cal Chair™ somehow interacts with these peptides or the ideas that exert control over them has not yet been tested and the Accelerator Chair™ Company makes no claim to this effect. Many practitioners who implement the system believe that the observable results of the Accelerator Chair™ may suggest such an association, and the Accelerator Chair™ Company looks forward to continued experimentation to explore this hypothesis. You will notice that you will not react to situations the way you have in the past. Emotional challenges will be much easier to deal with and you will move through issues more quickly. No longer must we endure ”old emotional baggage” that interferes with the quality of our life. Instead of being “run’ by old patterns, you can now live “free and clear” in this moment—making solution oriented choices for yourself. Now you can truly experience being in present time and living in the moment, unburdened and feeling creative possibility and joy. The Vo-Cal™ software records your voice pattern and plots it into a visual graph called a voice map. Seen below. The voice map is a series of voice prints that the client speaks into the Vo-Cal™ software that show areas of stress (excess) and areas of compensation (deficiency). Each map can be correlated with underlying attitudes, beliefs and emotions. 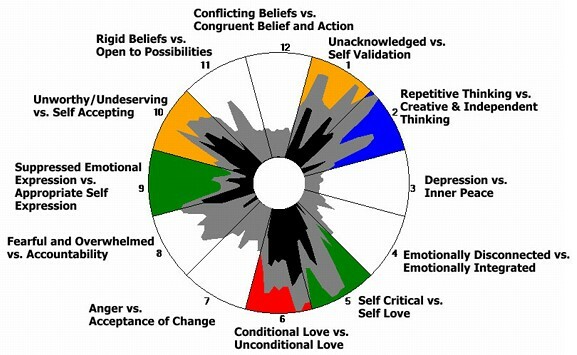 This data is very valuable when analyzed in relation to the emotional aspects of health and interpersonal relationships. Once a voice map is created, the Vo-Cal™ software determines the optimum deficiency. This is the area of the voice where the greatest compensation is occurring. The optimum deficiency is used as an instruction to the Vo-Cal Chair™, which generates a sequence of very low frequencies that are played into the Vo-Cal Chair™ chair. As you sit in the chair, you also listen to relaxing music and watch an amazing light show that your brain creates with the help of light frames. Each Accelerator Chair™ session includes 1-6 rounds. A round includes a new voice map and 2-10 minutes in the Vo-Cal Chair™. Through this progression of rounds, the body balances its emotional stress points. This shift is reflected in the voice so the progress is called voice mapping. The objective of voice reaming is to change patterns that are rigid or stuck to patterns that are dynamic, called floating patterns. Floating patterns are a reflection of your ability to adjust and adapt to stress in a healthy way. The Accelerator Chair™ experience is often described as unburdening, or a vast and continually expanding feeling of gratitude. The Accelerator Chair™ will add dramatic value to your life and the lives of your clients, coworkers, friends, and loved ones. For your benefit, we combine a number of approaches to health. This creates a synergy that makes your experience more efficient and more enjoyable.